The Cisco High-Density Analog and Digital Extension Module for Voice and Fax (EVM-HD) provides enterprises, managed service providers and service providers the ability to directly connect public-switched telephone networks (PSTNs) and existing telephony equipment to Cisco 2821, Cisco 2851, Cisco 3825, and Cisco 3845 integrated services routers. With support for up to 24 total voice and fax sessions, the Cisco High-Density Extension Module is ideal for networks with high analog (foreign exchange station [FXS], direct inward dialing [DID], and foreign exchange office [FXO]) and digital (Basic Rate Interface [BRI]) call-capacity requirements. 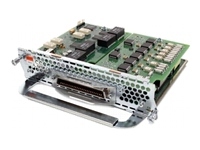 The Cisco High-Density Analog and Digital Extension Module for Voice and Fax (EVM-HD) is an industry-leading voice and fax interface module for Cisco 2821, Cisco 2851, Cisco 3825, and Cisco 3845 integrated services routers. It helps enable packet voice technologies with support for voice over IP (VoIP), including H.323, Media Gateway Control Protocol (MGCP) and Session Initiation Protocol (SIP); voice over Frame Relay (VoFR), and voice over ATM (VoATM), including ATM Adaptation Layer 2 (AAL2) and AAL5. The Cisco High-Density Extension Module allows Cisco 2821, Cisco 2851, Cisco 3825, and Cisco 3845 routers to connect directly to the PSTN and existing telephony equipment (for example, private branch exchange (PBX), Key system, analog telephones, and analog fax machines) through standard analog (FXS, DID, and FXO) and digital (BRI) interfaces. The High-Density Extension Module supports telephony toll bypass, new packet telephony applications, and full gateway integration within the Cisco AVVID (Architecture for Voice, Video and Integrated Data) IP telephony design. With support for up to 24 total voice and fax sessions, the Cisco High-Density Extension Module is ideal for networks with high analog and BRI call-capacity requirements.